Legally, we were married at a Civil Ceremony two days earlier here in Switzerland (at the beautiful Schloss Meggenhorn, just outside Luzern), but the big ceremony and celebration took place this day two years ago in Italy. 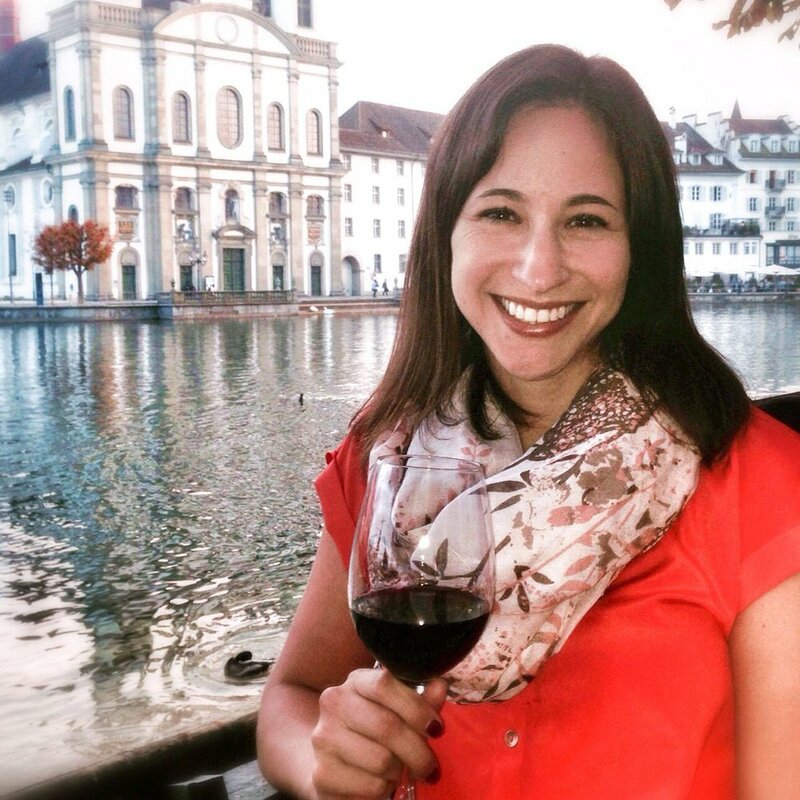 We've always had a special place in our heart for Italy and especially the Tuscany region - it is one of our favorite places to travel (we drive down at least twice a year) and we love the wine. So when it was time to choose a wedding venue, we immediately eliminated both the US and the UK in favor of Italy. Plus, since we got engaged on a vineyard in New Zealand, we loved the idea of getting married on a vineyard as well. 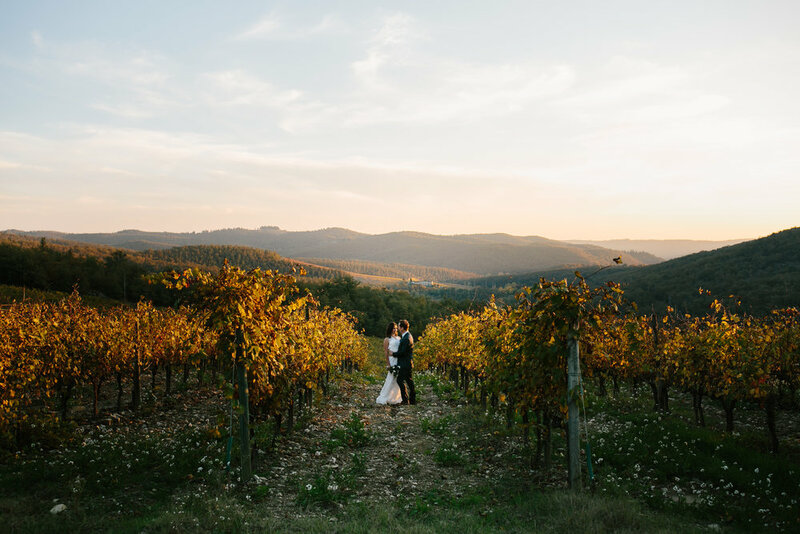 With the help of a wedding planner (Tuscania Events), we narrowed our venue options down to three and ultimately choose Castello di Meleto, which is in Gaiole in Chianti, just outside Siena. It's a castle on a hill, surrounded by a vineyard...what more could you want? What really sold us was the fact that we could accommodate all of our guests (approximately 60 people) onsite, either in the castle rooms or in surrounding cottages/apartments on the property. We booked the entire place for the weekend, so it was really cool to have a mini-village of all our friends and family, without random people intruding on our festivities. Despite the fact that it was the last weekend in October, the weather was perfect - we had mild, sunny, crisp, golden Autumn days the entire weekend. Guests flew in from the UK, the US, Sweden and Ireland and a large group of us drove down from Switzerland. We kicked off Friday night with a tour of the castle, followed by a wine tasting and pizza party. That was another major selling point - Castello di Meleto grows, produces and sells its own wine from the surrounding vineyard, ensuring we had plenty of good Chianti on hand the entire weekend. The actual ceremony was Saturday afternoon, in one of the gardens with a view of the castle in the background. We had a string quartet, the sun was shining and it honestly could not have been more magical. 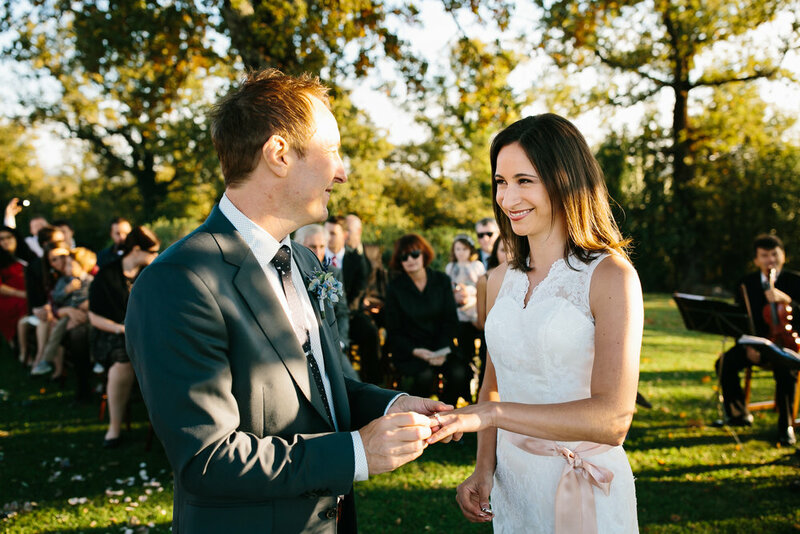 We kept things simple and stress free - I did my own hair and make-up, my dress was ordered online (from the amazing LaceMarry) and our wedding planner ensured everything was organized with all the vendors (who all wanted to be paid on the day of, in cash, because Italy). I honestly was able to enjoy every minute and was so glad to have an entire weekend surrounded by so much love and wonderful people. We also had an amazing photographer, Julian Kanz, who did a fantastic job of capturing all the moments perfectly. Following the ceremony, we walked back to the castle for cocktails in the adjoining garden and then dinner in one of the castle halls. The food was obviously amazing - is Italian food ever bad? We finished the night with dancing in the old stables. I'm not sure I left the dance floor once - although I think I only actually danced with Warren twice. I even stopped drinking at one point because I was having too much fun dancing. It was such a fun party, with such a great group of family and friends. It was the perfect amount of people and the fact that we spent the entire weekend together ensured I had plenty of time to actually talk and spend time with everyone. Sunday morning, we all had breakfast together and then parted ways. Warren and I spent the next week in Italy, slowly driving home. We spent a few days in Cortona (where I unfortunately got super sick; I actually had to leave Warren in the middle of a fancy 4-course, wine pairing dinner at our honeymoon villa to go lay down #wifeoftheyear) and Verona. Many of our guests went to Siena or Florence for a few days before flying back.